Once you start threading, there is no looking back! Combining our professional standards with the precise technique of threading, our skilled therapists can achieve that beautifully defined brow shape you’ve always wanted! How do I use my package? When booking online just place in the comments that you would like to purchase the package or let us know if you’re booking over the phone. We will help schedule your 5 waxing sessions in advance to lock in your therapist, day + time that suits you. Cancellations within 24hrs will forfeit session. Threading is a precise way of removing multiple hairs at once directly from the follicle. It is done by rolling a twisted piece of thread over the skin, and in doing so it removes the hair from root. It can be used to tackle an entire row of hair at once or to target a specific individual hair, making it extremely accurate and a great way to achieve a defined brow shape. Will Threading make my skin red? 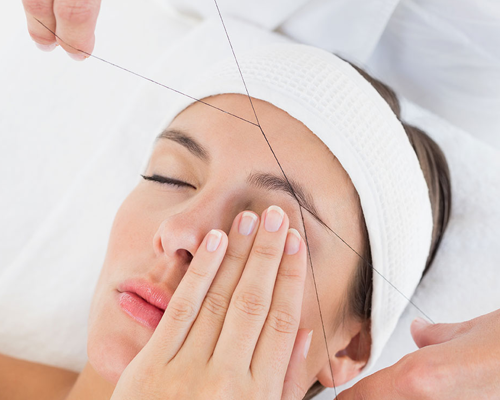 Unlike waxing, threading doesn’t peel or traumatise your skin. It leaves you with ultra smooth skin and slight to no redness or irritation. Any redness usually disappears within 30 minutes. Is Threading just for eyebrows? No, we use threading on the entire face including upper lip, chin, eyebrow and cheeks. Being chemical-free, it’s a great option for reaching delicate areas. 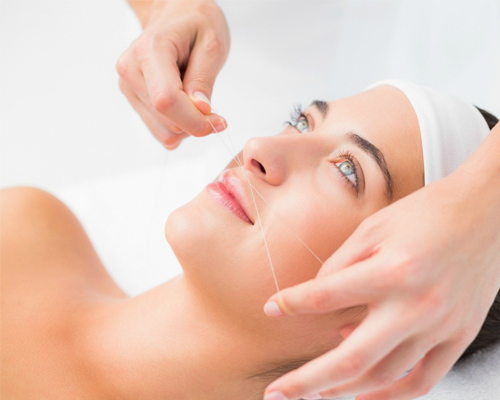 Threading is great for EVERYONE, especially those who may have sensitive or easily irritated skin, as it is generally gentler than waxing as there is no heat involved and no “ripping” of wax off the skin. It is not typically painful, but can be an unusual sensation, and as the thread moves across the face a small bit of friction can occur so slight redness can still be expected. Why should I change to Threading? Tweezing pulls out a single hair at a time, while threading removes an entire row of hair in a single action to give your brow a very precise, defined shape. Waxing breaks rather than removes the finest hairs, which actually encourages thicker, darker regrowth. Looking for a permanent solution to hair removal? Our latest technology machines deliver outstanding results. Treating most skin types and hair colours, our expert team will guide you through to permanent hair reduction – No Waxing, No Shaving!